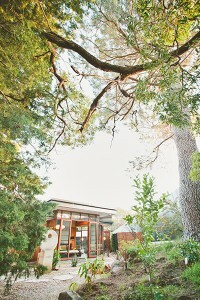 Set in leafy surrounds on the fringe of Stirling in the picturesque Adelaide Hills, Sticky Rice Cooking School has long been running hands-on cooking classes teaching their visitors how to create restaurant quality dishes. Thanks to the generosity of Electrolux, we were able to experience some of this as we got to take part in a ‘back to basics’ masterclass with Electrolux Ambassador’s Massimo Mele (Catering by Massimo, Salt Meats Cheese) and Stewart Wesson (Flinders Street Project, Whistle & Flute, Port Admiral Hotel). Zucchini dip with freshly made focacciaNow I don’t know about you, but taking control of a bunch of people of unknown and varying skill levels, who have never spent time in a kitchen together – let alone an entirely foreign kitchen – may seem like a recipe for disaster. Personally I feel pretty handy in this realm, but even so, the idea of preparing food for so many people, under the watchful gaze of two of Australia’s most accomplished chefs, this certainly ups the stakes a bit. However we were in very sure hands so my fears were completely unfounded. Even better than this – the end results were truly outstanding. Perusing what was to come….After the initial greetings and introductions to the chefs, with some delicious nibbles and a glass of wine to break the ice (and calm any nerves), we headed into the kitchen where we were broken into teams to begin the prep. I found myself on ‘team carrot’, tasked with putting together ‘Mumma Maria’s Pickled Carrots’. A seemingly simple recipe that sits in the pantry of Massimo’s family home at all times, we hoped to do this justice. Looking at those down the prep table dealing with whole John Dory, or working on the ingredients for the crispy thai eggplant, we definitely felt like we had the easier of the tasks. This didn’t remain the case though, as we got through our prep and then stepped into assisting in other areas. It just flowed – there was no real standing around and watching, as there were always different things to be assisting with. The staff at Sticky Rice helped keep the kitchen in a good state of order and tidiness, while Massimo and Stewart were guiding us around the tasks like a well-trained border collie herding their flock of sheep. Ok, so that may seem a little out-of-place, but I was at a country show on the weekend, so you will have to forgive me. Getting back to basics with cooking definitely did not mean sacrificing flavour or quality. There were still big and bold flavours on show here – just the techniques being employed were not going to be daunting for anyone that can tell the pointy end of a knife from the bit you should be holding. Stewart and Massimo are patient and skilled tutors, and fantastic ambassadors for Electrolux to have in their ranks. The recipes they brought with them to the table were approachable and easily repeatable in a home setting – although I have to say I would love to be investing in a new Electrolux steam oven. A bit big to just sneak out with me….and I think they might notice it missing…. What this all highlighted was something that I try and adopt myself – take some quality ingredients, treat them with respect, and the results can be spectacular. Even something as simple as pickled carrots, which with all due respect is never going to be a headline act, is absolutely delicious. Paired with the right foods, and this simple accompaniment lifts a dinner to even greater heights. The crispy Thai eggplant, full of flavours that we are well familiar with in our own home cooking, was absolutely brilliant and will be adopted into our repertoire immediately. Preparing and cooking whole fish, an idea I have always kept my distance from, suddenly becomes something I will be absolutely doing at home (although with a vegetarian wife, maybe not that often). Fresh honeycomb I have thought about making before but never got to doing, however this box has already been ticked. Testing the fishEven beyond this though, what I enjoyed most about the afternoon, was immersing in the universal truth that dining really does bring people together. We all got involved in different aspects of the dishes, stepping in and helping out where required. Sure, these were not our recipes, but this was our food that we created. Over a couple of glasses of wine, looking up and down the tables, there was a palpable sense of pride at the dishes that we had prepared. This was great food we had helped make, and now we were enjoying the fruits of our collective labour. Strangers a few short hours before, we were now connected by the simple and daily act of constructing and consuming a meal. Mammas pickled carrots (left) and the crispy thai eggplant (right)Leaving a little while later, it was definitely a bittersweet thing. It was a fantastic experience we had all taken part in, and we felt very lucky to have been part of it. However there was also disappointment it was over. We had walked into the relative unknown with some trepidation, yet come out with smiling faces, fully belly’s and a reinvigorated sense of culinary adventure. And this, valued readers, is the real gift that we received from Sticky Rice, Electrolux, Stewart, Massimo – and each other. John Dory with chorizo, olives, wine and herbsSticky Rice Cooking School and Villas is located at 96 Old Mount Barker Road, Stirling. You can read all about their upcoming classes, and details on their accommodation, on their website. Electrolux have a large range of home appliances, which you can see the details of here. The all important dessert – chocolate soufflé cake with fresh honeycomb, mascarpone and macerated strawberries. 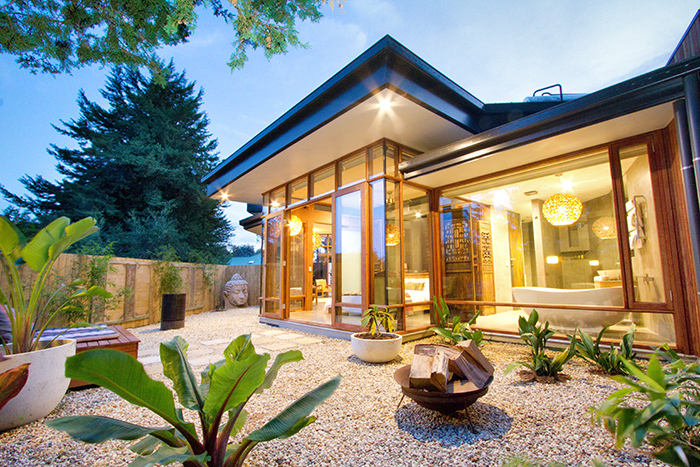 Sticky Rice Cooking School’s new luxury B&B Villas won the State award for Small Projects Category in the recently announced 2013 Australian Architecture Awards. The award allows then entry into the national awards which will be announced in November 2013. The Sticky Rice B&B project by John Adam Architect skillfully complements an existing Asian cooking school in Stirling. The architect challenged the client’s initial project brief and as a result the B&B was located well away from the rear of the cooking school and sited amongst the established garden. 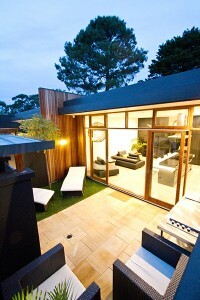 The sense of arrival has been now been enhanced and maximum advantage has been taken of the mature pine trees and plantings of the adjoining rear property. Walled front courtyards heighten the sense of arrival to villas. 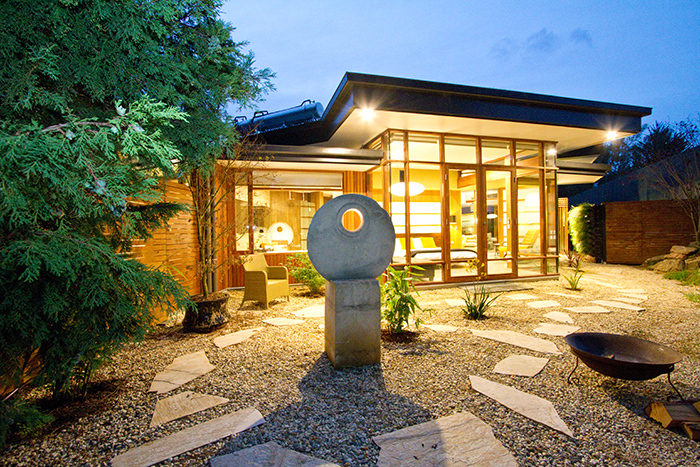 Colourful enameled steel clad entry gates open onto light filled and seemingly transparent spaces. The sensitively resolved interior and exterior environments reinforce the Asian heritage of the cooking school, with a mix of Japanese, modern Asian and Balinese themed spaces. 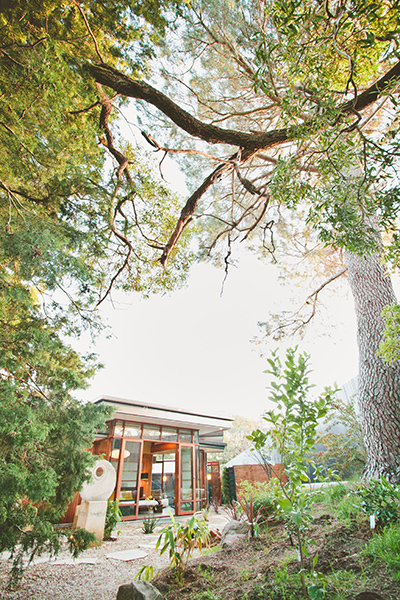 New narrow ceiling level highlights and full height window walls provide diverse outlooks from the bedrooms and bathing areas into secluded courtyards framed by the existing pine trees and sensitively themed landscape treatments. 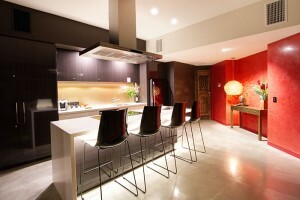 Realised under budget, this project has provided excellent value for money, and has resulted in an extremely satisfied client and unique accommodation experience for visitors to the cooking school. Quinten Long from Australian Traveller Magazine names Sticky Rice Cooking School in the Top 5 Best Cooking Schools in Australia on Chanel nine’s Mornings Show. Footage here for the 28 May 2013 live broadcast naming all top 5 cooking schools. Sticky Rice Cooking School will be five years old in Oct 2013 and to date has been able to attract an impressive list of professional guest chefs such as Michelin Starred David Thompson, Christine Manfield, Vietnamese Chef Luke Nguyen, amongst numerous other regular Top Chefs who teach 4-5 classes per week all year round. 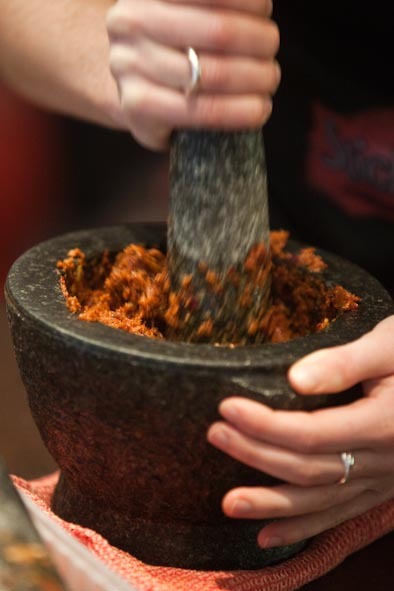 The school has always specialised in giving a hands on experience for all customers and now offers Spanish and Moroccan and Middle Eastern classes as well as every Asian menu imaginable. Channel 10’s The Living Room’s favourite Spanish Chef Miguel Meastro delivered a superb class at the school in November 2012 and hopes to return again this year to delight more fans. 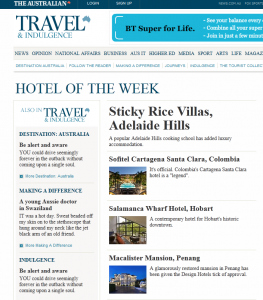 Recently opened and already named as Hotel of the Week by the Australian Travel and Indulgence are the schools 3 Luxury Asian Villas providing the ultimate foodie retreat in the Adelaide Hills. Guests of the villas can choose to stay in a Balinese Villa, a modern Japanese Style villa ( Yoko) or a decadent and romantic Zen villa which all house state of the art kitchens if you choose to have a private Chef as part of the package. Rumours have it that the Great Tetsuya will be staying in Yoko villa very soon and gracing the school with his presence! Our latest Chef to join Sticky Rice Cooking School, TY Bellingham, is making news. Check out what Ty and David Thompson have to say about the latest Thai Food Recipe Standards being introduced by Thailand. 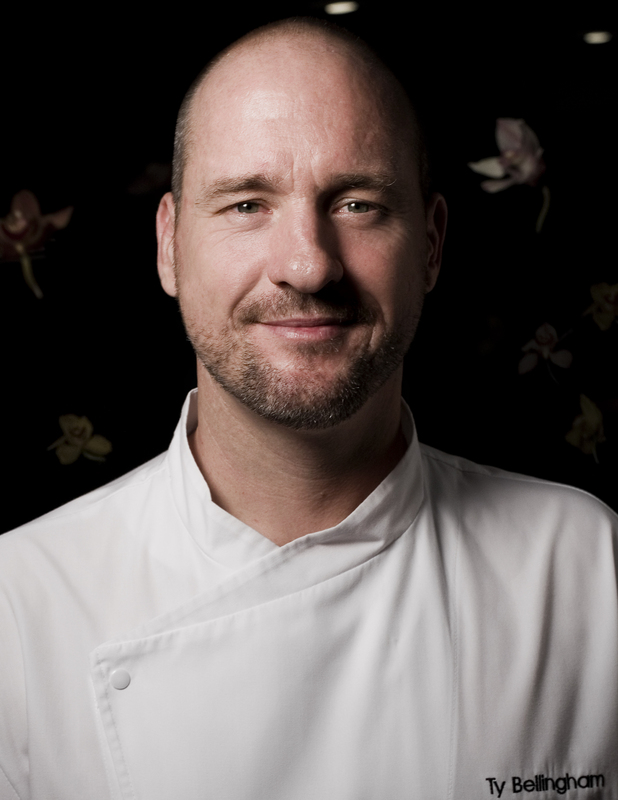 At the conclusion of his apprenticeship in 1996, Bellingham was hired to work under Michelin-star Chef David Thompson at Sailors Thai in Sydney. Manoeuvring his way up the ranks quickly, Bellingham worked from apprenticeship level to Head Chef, overseeing three restaurants under the Sailors Thai Group. In 2006, Bellingham was ‘Hatted’ by The Sydney Morning Herald Good Food Awards – one of the highest accolades achievable in the Sydney restaurant scene – for the first time. He went on to receive the same honour three additional times in 2007, 2008 and 2009. After 14 years at Sailors, Ty moved to New York City to run Kittichai restaurant in the chic Thompson Hotel, Soho. 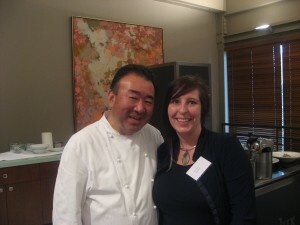 Ty has appeared on the first season of MasterChef, Australia, SBS Food Safari and Sydney Weekender. He is an experienced teacher having hosted cooking classes in Australia, Thailand and the United States. Since 2013 Ty is back at the healm of Sailors Thai but now he is finding time to visit Sticky Rice Cooking School on a regular basis to teach award winning cuisine. Ty will be here again on May 17th. We’re on top of the list! 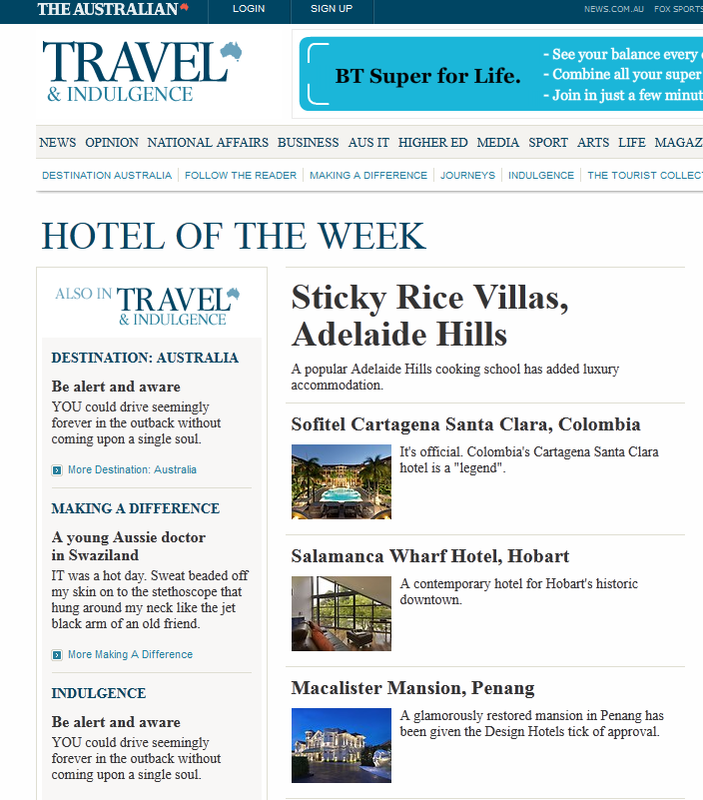 The Australian Travel and Indulgence has awarded us Hotel of the Week for our new luxury villas at Sticky Rice Cooking School. Check out pics of each villa here. 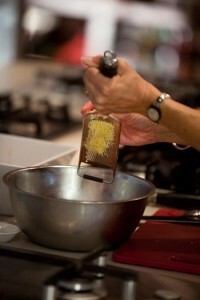 We have one last chance for keen cooks to participate in one of our special master classes in 2012. This class is limited to 10 people cooking alongside our Head Chef Brian Smith. You will be preparing a 5 course dinner for your invited guests and then sit down to enjoy matching wines during a long and lingering Saturday evening dinner. Miang of Southern Rock Lobster with Salmon Roe and Pomello, on Betel Leaves. Seared “Wagu Beef” Fillet with a salad of Crispy fish, Green Mango and Basil and Tamarind Dressing. Coconut Crème Brulee with Sesame Tuille and Dark Palm Sugar Toffee. Highly recommended by our past master class participants and lots of master class pics on facebook!